The site, on the corner of The Brent and St Vincent’s Road (then known as Fulwich Lane) was purchased in 1902 for £330. The congregation at Spital Street applied to build a Wesleyan Chapel in St Vincent’s Road in 1905. Permission was granted and the original chapel opened in1906. The church members knew that a bigger church would be needed in the future, so they reserved the front of the plot for this vision. Income was generated by renting out the spare land on the site as allotments. In 1960 the East Hill and Brent congregations agreed to amalgamate, sell the East Hill Church buildings and erect a new church on the vacant land at The Brent, to be linked up with the existing buildings on the site. 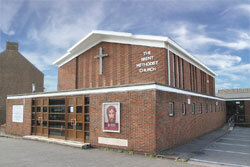 The new church was officially opened on 17th November 1962. The Wesleyan Chapel is now used as one of our church halls and in the years between 1910 and 1995 various building extensions and improvements were made. Our predecessors had the vision to reach out in the name of Jesus to the community of Newtown, Dartford and this is still our vision. Over the years many people have been part of the church family at The Brent. Our mission is to ‘Invite people to know and follow Jesus Christ’. We aim to demonstrate the love of Jesus by reaching out into the community, as well as providing a place of worship and fellowship.